Thank you for your letter of 29 November in which you graciously declined an invitation to become an honorary Founder Supporter of Clean Air in London for understandable reasons. You finished your very encouraging letter with an offer to ‘support Clean Air in London in any other way that I can’. There is a wonderful opportunity for London to be at the forefront of efforts to tackle the terrible impact of poor air quality which you have estimated as including 4,267 premature deaths in 2008 attributable to long-term exposure to dangerous airborne particles (PM2.5). As you will know, there were just over 50,000 deaths in total in London in 2007 (Source: Office of National Statistics). Clean Air in London asks only that you write please two letters now along the lines set out below. 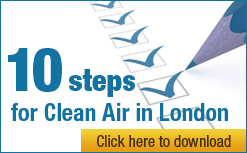 v. irrespective of your view on the likelihood or otherwise of the PM10 daily limit value being complied with throughout London in 2011 (on which you might choose to disagree), the UK has not met all the conditions necessary to obtain a time extension until 2011 to comply with that limit value in London. Please say also to Commissioner Potočnik that in your considered view the UK, as a Member State, should not oppose a European Court of Justice (ECJ) judgement confirming the above and requesting action to ensure full compliance. Please make a personal commitment to Commissioner Potočnik that you will do everything you can to ensure these breaches will be rectified so as to avoid after an ECJ judgement: a first written warning from the European Commission for non-compliance with the ECJ judgement; a final written warning; and a further ECJ judgment that would trigger fines you have said could total £300m per year per pollutant. Given the scale, complexity and urgency of the UK’s air pollution problem there is a need for national and London action and cross-departmental Government action on an almost unprecedented scale to tackle this little-recognised public health crisis. Clean Air in London’s second request is that you write to the Prime Minister within the next week informing him that you have written to Commissioner Potočnik along the lines outlined above and saying that, in your considered view, the only way to tackle successfully this public health crisis within the timescales needed is for the Prime Minister and you to chair jointly a Clean Air Compliance Taskforce steering group that would meet once a month between now and 2012. I would encourage you to establish the steering group as a cross-party entity that would meet under the Chatham House Rule unless the Prime Minister and you consider this would be unworkable. As an aside, Clean Air in London’s view is that the costs and management task of tackling of the NO2 challenge must be met 50% by London and 50% by central Government. Both these actions are needed now and you could do them within the next week. If you will take these steps, the specific actions necessary to put London at the forefront of tackling air pollution will follow.